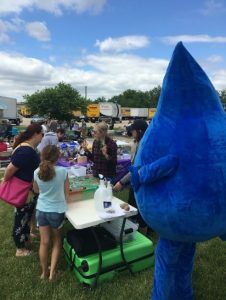 The Protect Wisconsin Waterways crew participated in the Basics Cooperative Block Party in Janesville on Sunday, June 3. Our representatives engaged with citizens and families that share a common interest in sustainable practices. We used the Enviroscape to show attendees the many factors that affect stormwater. We had a very positive response , especially from children who enjoyed viewing the Enviroscape and helping us “make it rain”. 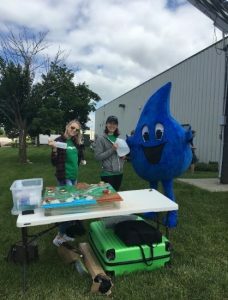 Our mascot Splash was also a big hit with children and families. 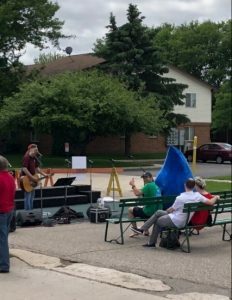 After hearing about the Enviroscape, attendees received pamphlets with more information about protecting stormwater and Protect Wisconsin Waterways.